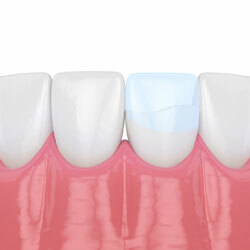 Tooth bonding is also used for teeth fillings instead of amalgam fillings. Many patients prefer bonded fillings because the white color is much less noticeable than the old silver amalgam fillings. Bonding fillings can be used on front and back teeth depending on the location and extent of tooth decay. Bonding is less expensive than other cosmetic treatments and usually can be completed in one visit to our office. However, bonding can stain and is easier to break than other cosmetic treatments such as porcelain veneers.